Slipping into warm water after a long day is a relaxing, restorative experience. There’s nothing like being enveloped by liquid warmth to elicit a sense of carefree tranquility. There are a number of ways to think about heating pools and spas. Your specific sensory desires, your schedule, the climate where you live, and the heating technologies available all play a role in how you approach making your pool or spa warm and welcoming. Most stand-alone pools and pools with attached spas use either natural gas-fired heaters or electric heat pumps for heating. Natural gas is the most widely used energy source. 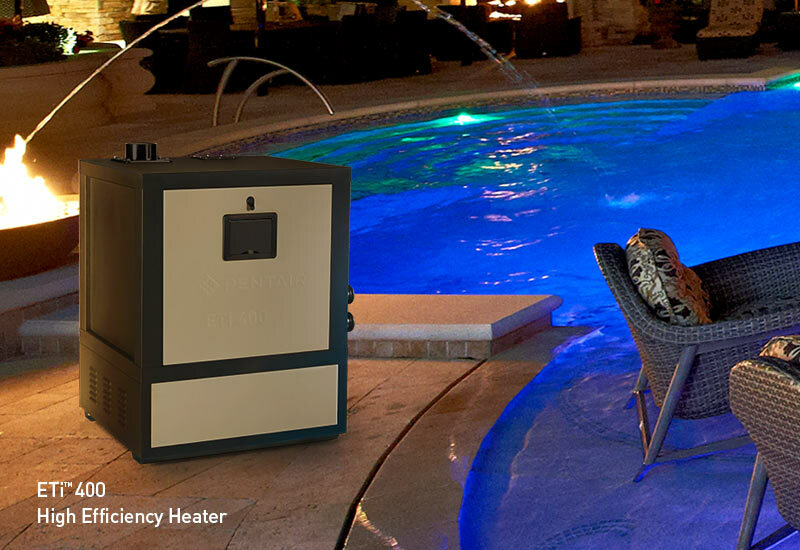 These heaters work in a straightforward way; a gas flame transfers heat to your pool’s water through a metal heat exchanger. Natural gas is readily available and offers fast heat-up. In regions where it’s used widely for home heating, it can offer good economics for pools and spas. This technology provides the fastest and most reliable heat in colder climates, and it’s especially popular with pool/spa combinations where the goal is to quickly get spa water up to comfortable, soaking warmth. Heat pumps work differently. They use electricity to circulate a refrigerant through the unit to extract free heat out of the air. They extract the heat using the thermodynamics of evaporating and re-compressing refrigerants. This process uses far less electricity than it would take to produce the same amount of heat with an electric heating element. Heat pumps are popular in many climates, especially warmer ones, and also for pools and spas where the goal is temperature maintenance rather than fast heat-up. Many pool and spa owners in cooler climates are interested in extending their season. And the efficiency of today’s heating technology can make doing so more affordable than ever. If the goal is to maintain a set water temperature in a pool during cooler months, the efficiency of heat pumps makes them a good choice, especially in regions where electricity prices are modest. However, when nights get longer and cooler, a heat pump alone might not be able to maintain desired temperatures. This is where a supplemental gas-fired heater might be used at night to keep the water comfortably warm, and also to provide fast heat-up of an attached spa. Pool and spa owners are becoming increasingly energy-conscious, from the standpoints of both environmental stewardship and practical economics. Fortunately, soothingly warm water doesn’t need to come with excessive energy use. As already discussed, heat pumps can be remarkably efficient; even in cooler northern climates, they can keep a pool comfortable on a budget for much of the year. There have been many energy-saving advances in gas-fired heaters. Some heaters are now using premixed-gas (PMG) combustion technology, which creates a more uniform mixture of air and fuel for greater combustion efficiency and lower emissions. In combination with better electronic on-board control systems, as well as external full-pool automated control systems, these heaters can help pool and spa owners enjoy warmer water for less money, for more of the year. Having warm water ready no longer means you’re tied to controls in your backyard. An automation system allows remote operation so you can control and preset heating from wherever you are, whether you’re commuting home from a long day at work, on an arduous journey, or just a local errand. Your warm water experience can also be enhanced with visual and other sensory effects like underwater and landscape lighting, jets and bubblers, or the soothing sound of a waterfall.